Last year Anderson scored one of the biggest critical and commercial hits of his career with Moonrise Kingdom, a tale of innocent young love between two seemingly disparate pre-teens (Jared Gilman and Kara Hayward) living on a picaresque New England island in 1965 that is as warmly funny, oddly endearing, and surprising as the rest of the features in his colorful filmography. The lead performances by Anderson’s two youthful stars were ably supported by terrific turns from Bill Murray and Frances McDormand as Hayward’s parents, Edward Norton as a dutiful scout troop leader, Bruce Willis as the island’s lovelorn police chief, Tilda Swinton as a social services official known only as “Social Services,” and Bob Balaban as a character who both narrates the movie and occasionally turns up on screen to offer helpful exposition. I saw Moonrise Kingdom on the big screen with a date when it first opened in Richmond back in July and found it to be one of the best films of 2012 and deserving of a raft of Oscar nominations, but sadly (and criminally) it received only one. The screenplay that Anderson co-wrote with Roman Coppola for Moonrise Kingdom, which was the recipient of the film’s sole Academy Award nomination, in the category of Best Original Screenplay, has been released online as part of its award campaign. Unlike most film scripts available for reading on the Internet this particular one comes fully illustrated with production artwork, behind-the-scenes photos, and other charming pieces of paraphernalia related to Moonrise. The presentation of the script is very much keeping in tune with the haunting yet playful storybook atmosphere of the film. You can check it out here and also download a PDF file of the interactive screenplay here. 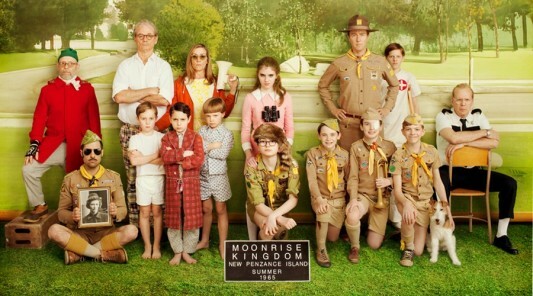 Moonrise Kingdom is now available on Blu-ray and DVD. If you are sick of the sparkly vampires and megabudget superhero flicks and are in the mood for a great little movie that offers many surprises over repeat viewings then it would behoove you to check out Wes Anderson’s sweet-natured fable. I also highly recommend the soundtrack.